Go (Weiqi), along with calligraphy, painting, and Guqin (stringed instrument), used to be one of the four arts in classical, elite society. A popular board game in China, Japan, and Korea, it was first introduced to Europe in the late 19th century. Go is often thought as an exercise conducive to concentration and better judgment. In the past two years, the victory of Google’s AlphGo over human champions has evoked public enthusiasm and become a subject of much discussion. 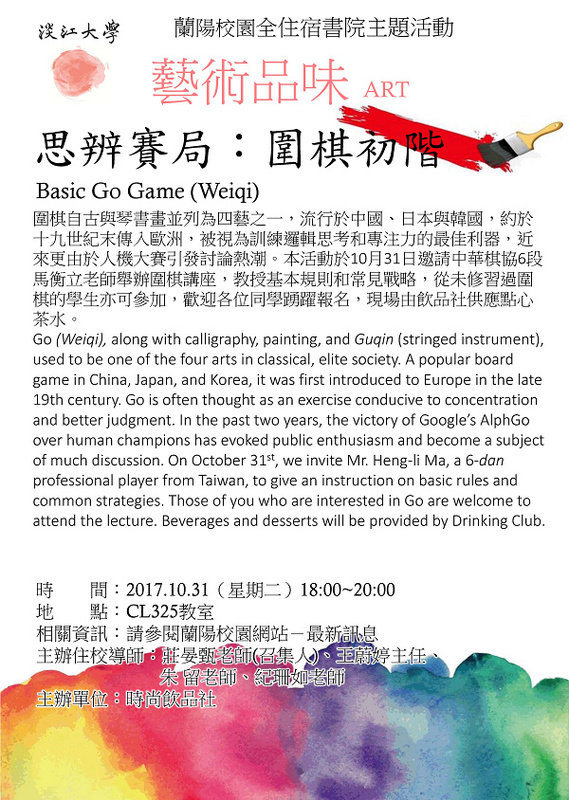 On October 31st, we invite Mr. Heng-li Ma, a 6-dan professional player from Taiwan, to give an instruction on basic rules and common strategies. Those of you who are interested in Go are welcome to attend the lecture. Beverages and desserts will be provided by Drinking Club.